BinaryOnline’s bonus programme is fairly standard with cash top-up bonuses applied to deposits and 2-3 week free signals packages for accounts higher deposits have been made into. These range from 25% to 75% and are based on the value of the deposit made, with higher deposits attracting a higher bonus %. Traders must trade the value of the bonus 30 times, considered to be the case only after the trader’s original funds have been exhausted, before subsequently being able to make withdrawals. This is very restrictive and the signals packages also not very generous with 2-3 weeks duration, leading to a low score here. BinaryOnline uses SpotOption software for its trading platform, the market leader and a very good product, leading to high marks in this category. Customer support is reasonable with UK and Australian phone numbers provided and agents available 24/7 and an email option is also provided. However, no live chat option is available so accessing quick customer support if not in the UK and Australia could add to the phone bill. The customer service rating is, therefore, an intermediate one. BinaryOnline offers around 200 different tradable assets across cryptocurrencies, forex, commodities, stocks, indices and ‘Pairs’. While there are brokers that offer a longer list of tradable assets, the diversity and balance between asset classes, all of which offer a very nice variety of options, leads to a high score here. Choosing the right broker is the first major choice new binary options traders have to make when starting out in their trading career. More experienced traders also occasionally, and rightfully so, cast their eye around the market to see if there isn’t perhaps a better option than their current broker. However, the boom in popularity of trading binary options has also led to parallel boom in the number of brokers on the market offering trading platforms. Properly researching the huge number of binary options brokerage options available to traders is, without help, quite the mission! Luckily, we’ve taken a large part of the load off by nicely organizing information on the qualities and characteristics of brokers that traders need to know to make an informed choice. Our broker reviews cover trading platforms and features, trading conditions, company background and regulatory status, bonuses and more so you have all of your research neatly arranged in one place! In this review, we cover BinaryOnline. A broker fresh to the market, BinaryOnline was established as recently as 2016. The brand is owned and operated by parent company Zola Ltd., registered in the EU with its base in Sofia, the capital city of Bulgaria. While BinaryOnline is not yet a regulated binary options broker the company does promise that all client funds are held within segregated EU-based bank accounts. This means that in the worst case scenario of the broker running into trouble funds held in trading accounts should still be safe and retrievable. Despite having only been around for a little over a year, BinaryOnline’s website claims over 200,000 trading accounts have already been opened with it with account holders coming from over 100 different countries. 7.5 million binary option positions are taken on the platform every month – quite an achievement! BinaryOnline’s trading platform is a SpotOption white label. SpotOption’s binary options trading platform is the market leader is reputedly around 40% of all binary options trading globally uses the trading software specialist’s product. The trading platform’s popularity is not a coincidence and it is a top product. While ‘the best’ binary options trading platform is a subjective opinion, it is fair to say that at least in terms of the number of traders that choose to use it internationally, BinaryOnline provides its traders with the most popular trading environment on the market. 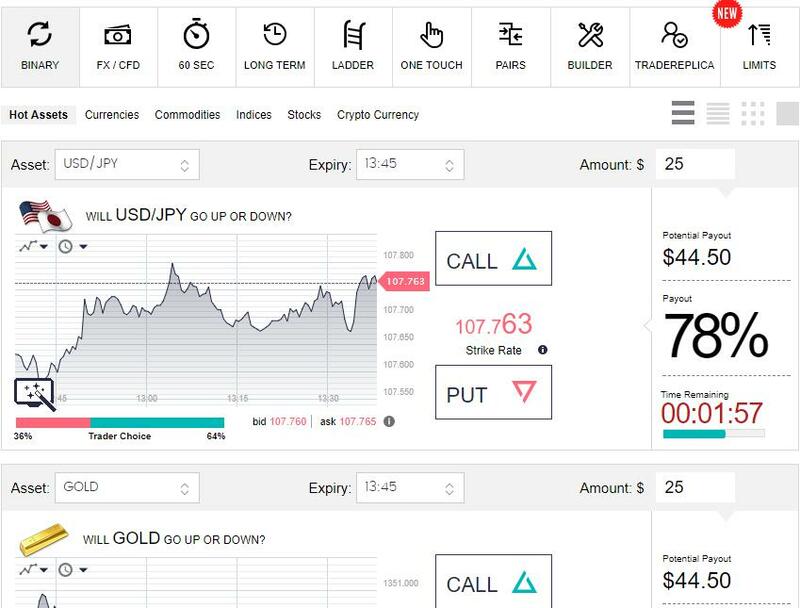 Well designed, intuitively usable and featuring an impressive variety of binary options formats and features that give traders more control, few will find much to complain about here. A top trading platform. The desktop version is browser-based and does not rely on a software download so traders can log in and use the platform from any device that supports an internet browser. Traders have a choice between classic binary options with expiry times of between 30 minutes and the end of the trading day as well as 60 Second and Long Term options, which can have expiry times of up to 6 months. Ladder Options, an alternative format that sets tiered strike prices, with payouts increasing depending on how far up the price ‘ladder’ the binary option closes, is another choice available, as are One Touch options. When trading One Touch options, instead of simply predicting if the traded asset’s price will be up or down by expiry, the trader has a strike price that must be ‘touched’ at any point before expiry. Pairs options pair related assets (eg. BMW and Daimler) like forex pairs. The option is based on the performance of one side of the pair against the other, again in the same way forex pairs work. FX/CFD options allows traders to take advantage of stop-loss, take-profit and leverage options. Finally, the ‘Options Builder’ feature allows traders to choose their own expiry time for a binary option to the hour and minute. Mobile app versions of the trading platform are also available for Android and iOS smartphones and tablets and can be downloaded for free from Google Play and the App Store free of charge. These are also build on SpotOption software and provide all of the functionalities of the browser-based trading platform. The apps meet the same high design and usability standards as the desktop version. BinaryOnline traders have access to over 200 tradable assets. All the major asset classes are well covered with the variety of choice available in cryptocurrencies and individual company stocks a particular highlight. A number of in-trade mechanisms giving increased control are also a feature of the trading platform. Traders can use the Rollover option to extend an original expiry time, the Double-up option to double the investment stake at any point up to 5 minutes before a binary option’s expiry (though payout will be based on a new offer at the stake is doubled) and the Sell-Option setting allows an option to be closed early. This feature allows the trader to lock in a profit or cut a loss. The minimum investment stake is set at $5, or equivalent in £ or € and payouts can reach 85%, though Ladder trades can see payouts as high as 1000% if the asset’s price hits the furthest strike price level. A charge of 5% of the deposited funds held within a trading account is charged to accounts that are classified as ‘dormant’, defined as having seen no trading activity in at least 30 days. Once an account has been assigned ‘dormant’ status at least 5 trades must be made over the next 30 days for it to be returned to ‘active’ status. Fees applied to withdrawals include a $50, or £/€50, charge for wire transfers and $/£/€ 25 + £5, $10, €7 for debit and credit card processed withdrawals. Standard Account holders are supported by a ‘Personal Trading Advisor’ and given a free signals package for 2 weeks while Premium Account holders also have these perks plus an extra week of free trading signals. It should be noted that cash top-up bonuses have a x30 trading turnover condition attached to them. Traders should think twice about accepting this bonus as the bonus is only considered to have been used after the initial deposit and any returns on trades have been lost. This means that before a trader who has been given a bonus can make withdrawals their account must have seen its balance first reduced to the value of the bonus and then have traded this value x30. Practically speaking, accepting a bonus makes it extremely difficult to subsequently make any withdrawals, which is a big negative for BinaryOnline. We would advise traders using this broker to decline any bonuses offered. Deposits and withdrawals to and from a BinaryOnline trading account can be made via either wire bank transfer or debit and credit card with e-payment processors like Skrill not currently supported. Customer support is provided by telephone or email. UK and Australian telephone numbers are available and support hours are 24/7. Extra features include an extensive educational and market news and research resource including video tutorials, articles, e-books, webinars and the ‘Traders TV’ online channel. Islamic Accounts are also available as is a free demo account. Signals are also available but are provided for a monthly charge, though Standard and Premium Account holders are given signals for free for 2 and 3 weeks respectively. BinaryOnline traders are provided with an excellent binary options trading platform with a host of value-added features and resources as well as mobile trading apps. $5 minimum investment stakes is a major plus and a very good range of tradable assets is available. The broker lets itself down slightly on its bonus conditions which make it advisable traders don’t accept the bonuses offered and relatively steep charges attached to debit and credit card withdrawals making withdrawing smaller sums expensive. If these areas are improved upon, BinaryOnline will be a very competitive broker. What is the minimum deposit with Binary Online? What is the minimum investment stake? Does Binary Online offer cryptocurrency instruments?